Were Here to Stop the Coolest Little Bird From Disappearing Forever. 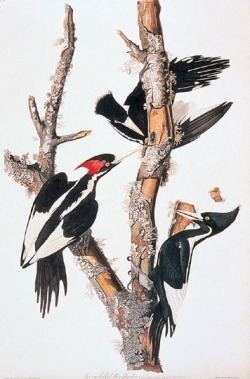 "Painting of the Ivory-billed Woodpecker by J.J. Audubon, showing male (left) and female plumages, and individuals involved in characteristic foraging behavior -- stripping bark from dead trees in search of beetle larvae." 1.